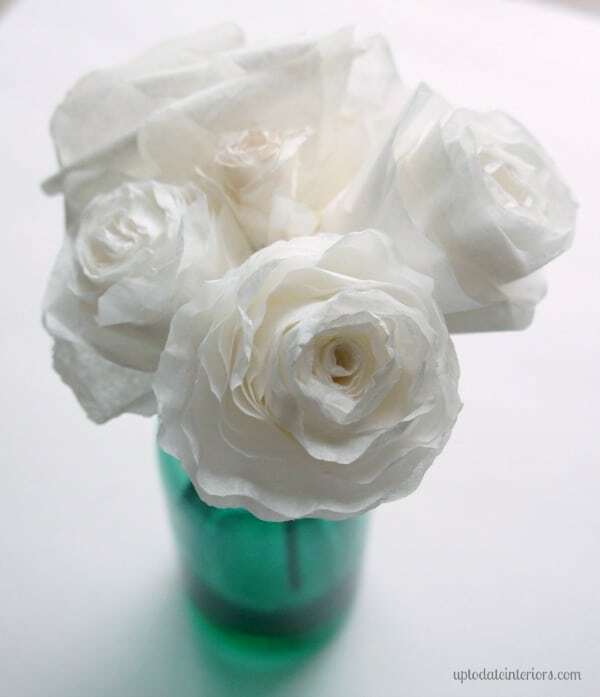 Make gorgeous paper flowers with three different techniques for coffee filter roses including step by step instructions and photos. Hey there! 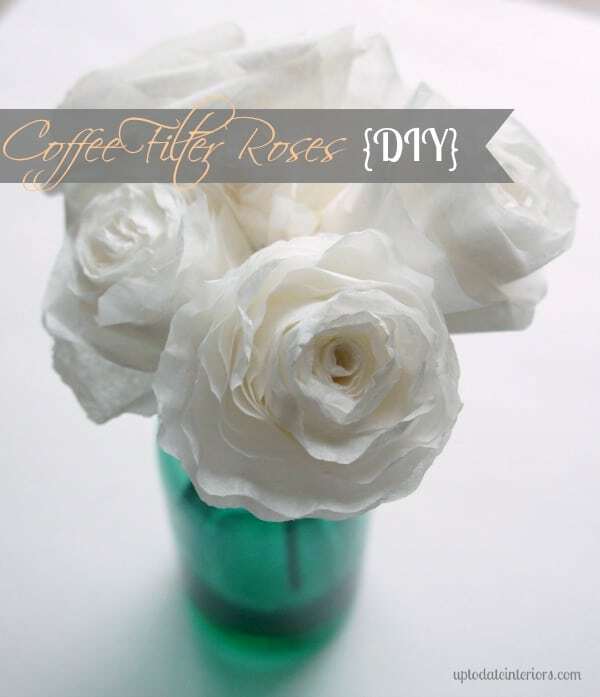 Do you remember the Coffee Filter Roses I made this week? 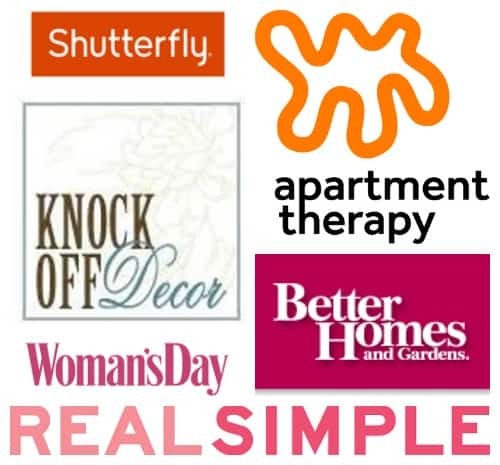 I had such an overwhelming positive response to them and a request on how to make them, I wanted to share with you the resources I used and which one is my favorite! Here are three different methods I tried after I researched the good ol’ internet. 1. 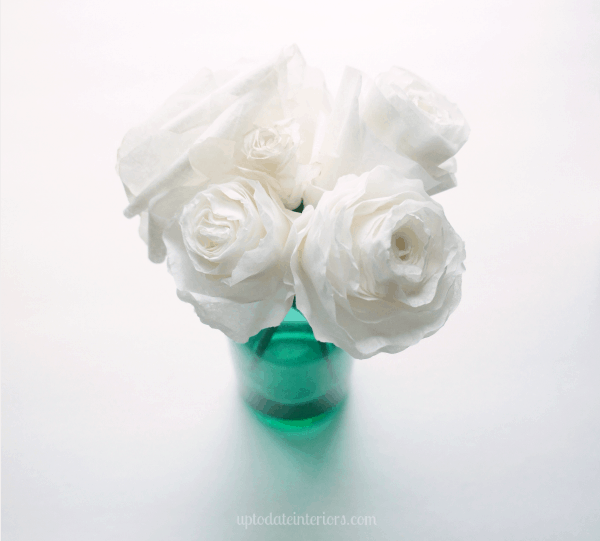 Martha Stewart– Technique: Cut separate rose petals. She has a printable template to use. I eyeballed it and created one rose this way. It was the most time-consuming but the roses have individual petals. 2. Easy Handmade Recipes. Technique: Layers of round coffee filters to create a full flower. This is the easiest technique that I found and she has a great tutorial for dying the filters different tints and assembly. This one is best if you want a big, full bouquet! 3. Salvaged Whimsy. Technique: Rolled paper flowers. These were my favorite! The tutorial is easy to follow. You can use small or large round coffee filters. Cut a spiral shape out of the 3 or 4 coffee filters (together, to save time!). Roll each one starting from the center and adding on a filter until you have the fullness you want. 1. How to attach a stem: Hot glue a skewer to the base of the flower. Wrap florist tape at the base and spiral down to cover the stem. I added a bit of hot glue to get mine started. 2. Dye your flowers: You can dye your flowers with a water-color bath, tea, or in my case, red wine vinegar. (The smell went away after it dried. It wouldn’t be right to have a stinky rose.) Hang it upside down to dry. You can also use a hair dryer to speed up drying time. 3. 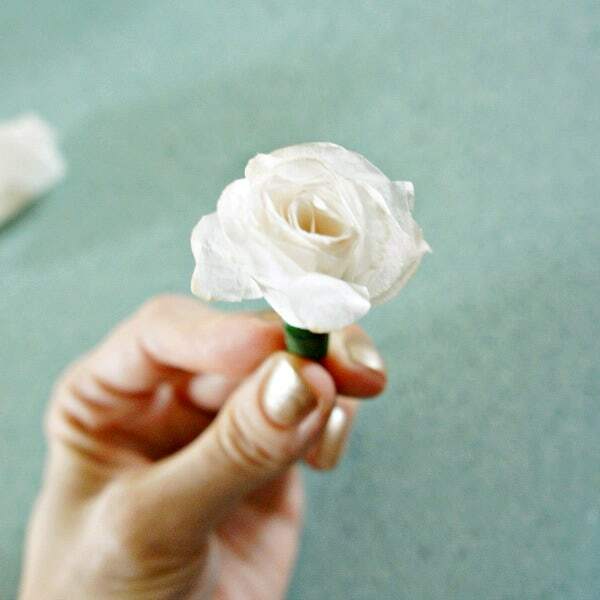 Finishing touch: You can curl some of the petals under by rolling the edges around a skewer. I love how realistic these turned out and they won’t die. Bonus. You could even scent them with perfume or oil. 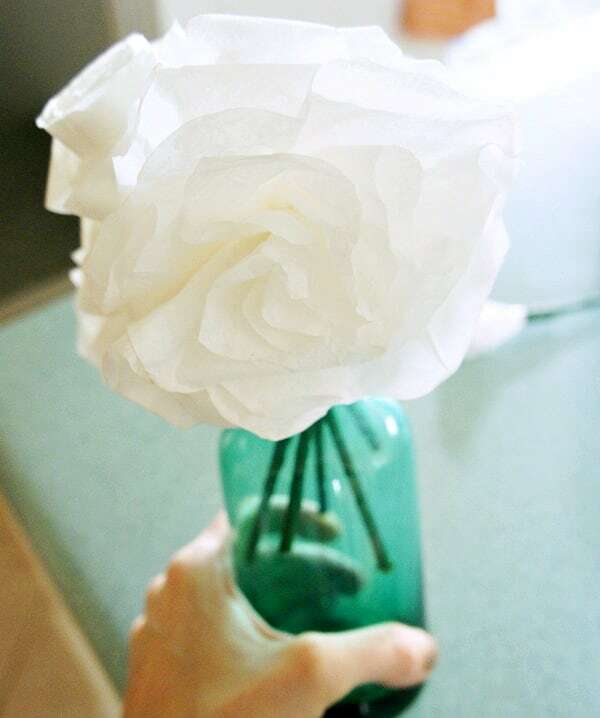 Do you have a method for paper flowers? I would love to hear about it! P.S. Have you signed up for my FREE 5 day decorating course yet? « A Room Tour You Are Gonna Love! Beautiful, cheap and easy. I like that you dyed the paper. I love the white rolled version…they look very real. Thanks for the tut. I have made the martha ones, but I like your version much better! Thanks Alane!! I like Martha’s but they were a lot more time consuming. Thanks for the sweet compliment!! 😉 I’m so glad you enjoyed my tutorial. we sure could use a little more help with the rolling part #amateur #kids #thanks can you post a video or more interim steps? When you roll the coffee filters, make sure one end it tight and the other end loose to create the flower shape. Hope that helps! Thanks for the roundup. I’ve seen all these tutorials before (I’m researching these to use as centerpieces for my wedding next fall) and I think I’m gonna play around with the Salvaged whimsy one and the Martha Stewart one by using rolled flowers for the interior and a couple layers of the larger petal template from the Martha Stewart ones to give the individual petal look on the outside of the flowers. If it’s a success I’ll report back and post pictures. How did this work out? I’m trying to find good tutorials for my wedding! I love this. We are using paper flowers for my grandson rehearsal djnner. This new method is great allso. Thanks for sharing. That will be so pretty! Thanks for the kind words. These look great and I am excited to try them. One question though, do you dye them before or after assembling? Gorgeous! Did you dye the white ones or did you use white coffee filters and just leave them be?